A psychologist has said Manning felt extreme mental pressure in the “hyper-masculine” military because of his gender-identity disorder. 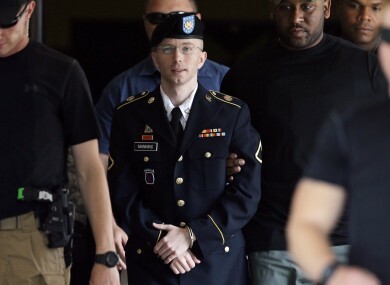 BRADLEY MANNING TOOK the stand yesterday at his sentencing hearing in the WikiLeaks case and apologised for hurting his country, pleading with a military judge for a chance to go to college and become a productive citizen. He addressed the court on a day of often emotional testimony from family members about his troubled childhood and from a psychologist who said Manning felt extreme mental pressure in the “hyper-masculine” military because of his gender-identity disorder, his feeling that he was a woman trapped in a man’s body. The soldier said that he understood what he was doing but that he did not believe at the time that leaking a mountain of classified information to the anti-secrecy website would cause harm to the US. Though he often showed little reaction to court proceedings during most of the two and a half month court-martial, Manning appeared to struggle to contain his emotions several times during testimony from his sister, an aunt and two mental health counselors, one who treated him and another who diagnosed him with several problems. Speaking quickly but deliberately, Manning took only a few minutes to make his statement. He appeared to be reading it from papers he was holding and looked up a number of times to make eye contact with the judge. It was an unsworn statement, meaning he could not be cross-examined by prosecutors. His conciliatory tone was at odds with the statement he gave in court in February, when he condemned the actions of US soldiers overseas and what he called the military’s “bloodlust”. Manning eventually came out to Captain Michael Worsley, emailing the clinical psychologist a photo of himself in a long, blond wig and lipstick. The photo was attached to a letter titled “My problem,” in which Manning described his internal struggle and said he had hoped that a military career would “get rid of it”. Worsley testified yesterday that the soldier was struggling under extreme conditions. Navy Capt. David Moulton, a psychiatrist who spent 21 hours interviewing Manning at Fort Leavenworth, Kansas, after his arrest, testified as a defence witness that Manning’s gender identity disorder, combined with narcissistic personality traits, idealism and his lack of friends in Iraq, caused him to conclude he could change the world by leaking classified information. Also yesterday, Manning’s sister Casey Major, 36, testified that they grew up with two alcoholic parents in a rural home outside Crescent, Oklahoma. She said their mother attempted suicide with a Valium overdose after Brian Manning left his wife when Bradley Manning was 12. Email “Bradley Manning takes to stand apologising for hurting US ”. Feedback on “Bradley Manning takes to stand apologising for hurting US ”.